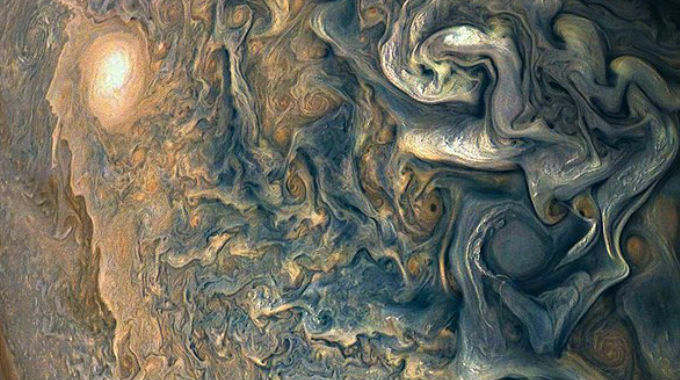 Jupiter is the largest planet in our solar system, whose gravity is so powerful it protects Earth and the inner solar system from the threat of incoming comets and asteroids. Jupiter’s cycles are regular, balanced and stable, its phases with the Sun span in even thirds around the sky, evoking the strength and stability of the triangle. Accordingly, Jupiter signifies benevolence, expansiveness, wealth, opportunity, stability, trust, faith, confirmation, friendship, gifts, talent, honors and wisdom. The condition of Jupiter at the time we were born says something about the quality of the year that we come from, where there is greatest excess and abundance, how we do the most good and how we are most blessed and honored. Jupiter ennobles and expands the topics of the signs it transits through.